In fact it is. Based on what my expat friends said, and the Korean music that was being played inside, cafe/bakery chain “Tous Les Jours” is in fact a Korean-owned business. The bakery section resembles the self-service places that you find in Hong Kong, and to a certain extent, Chinatowns around the world. The branch that I went to was outside the Wudaokou subway stop on the 13 (the stop you use to get to Tsinghua and Peking U), where there is also a relatively large population of Korean students. It is basically a cafe like would find in Asia. They serve you sandwich which bread is sub-par for the tastes of a Montrealer (it’s like sliced bread, but slightly sweet), but which fillings are familiar (ham and cheese) yet exotic (something else that tasted kind of sweet). It’s a little pricey for the average Beijinger, but totally affordable for the visiting Canadian (32 RMB for a lunch). 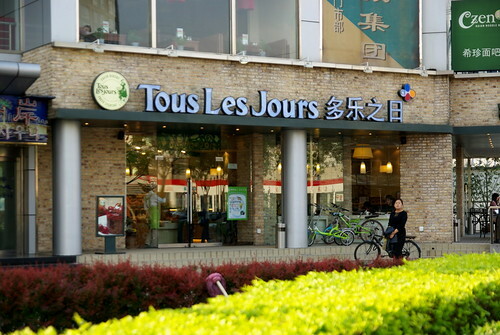 The interesting anecdote with Tous Les Jours, was that protesters against France’s stance on China and the Olympics, who protested in front of the many French businesses in China like supermarket Carrefour, were also seen in front of the Wudaokou branch of TLJ, as testified by one Beijing expat blogger, and another satirical blogger (who had a picture – which indeed shows the plaza facing Wudaokou station, where Tous Les Jours is, with full of people on the street + security guards). That’s funny. Didn’t know that myself. I believe Mr. Pizza chain of restaurants is also Korean owned (or originates from there). Like everywhere in Beijing, the pizza is awful.